The 8-bit Apple II community would be pretty happy with just a LIRON clone. A LIRON clone is not quite as useful for the GS, obviously, although it could be useful to have a LIRON clone with a Floppy Emu for hard disk images leaving the built-in controller available to connect a real 5.25″ floppy drive. Or to use two Floppy Emus at once. 5.25″ controllers are probably the least exciting, as any II/II+/IIe you find on eBay is probably going to have at least one. That’s very exciting! I’d imagine many people would want both a Yellowstone and a FloppyEmu so you could use an easy cable between them and bypass using the hard-to-find DB-19. Are the original external drives still common and mostly functional? There might not be a huge need for only the Yellowstone but maybe the combination of your productions would be a hit. Fantastic! What about backporting the IWM core to the Plus Too? There’s nothing like running it on a different platform to shake out any remaining bugs. I’ve got to agree with even just a LIRON clone being something the community is calling out for. Evidence is we’ve seen them sell for huge amounts of money on eBay recently and people are asking even more huge sums for them now. I’ll personally buy at least one, if for no other reason than I think it would go so well with my FloppyEmu which I love. I also agree that the Super Drive controller would be cool, but the drives are hard enough to come by that it is of limited value and I don’t see it buying any extra functionality for use with FloppyEmu. And as has been noted, if there was never any commercial software released on 1.44M media, then there isn’t a lot of point. A FloppyEmu is a far better option these days. I’d be happy with just a floppy controller. Separate FPGA projects wouldn’t need to complicate this one. As I said before, I’m perfectly willing to buy a JTAG programmer if I need to in the unlikely event I’d ever want to update the card. Especially if it can work with one of the very inexpensive ones that have been discussed prior. Thanks for these perspectives, they’re very helpful. I’m leaning towards having Liron and Disk II functionality, selectable with a switch. No Superdrive mode (no high density floppies), no serial EEPROM, and no hypothetical “non-disk functions”. Keep things as simple as possible, so I can actually hope to finish. A Disk II controller mode isn’t very exciting by itself, but would make the Yellowstone much more versatile as a secondary disk controller in a system, or when used with Floppy Emu. Without a Disk II mode, you’d have to physically reconnect Floppy Emu to a different controller card whenever you wanted to switch between Smartport and 5.25 inch disk emulation. If I focus only on Liron and Disk II support, it’s less likely there would ever need to be firmware upgrades or bug fixes. The Liron and Disk II designs are 30+ years old and it’s unlikely I would ever “upgrade” them. Only the potential Superdrive and hypothetical non-disk functions really call for firmware upgrades. Without them, I would feel better about shipping a card without any simple way to perform end-user updates. But JTAG firmware updates would still be possible for advanced users with the right equipment. 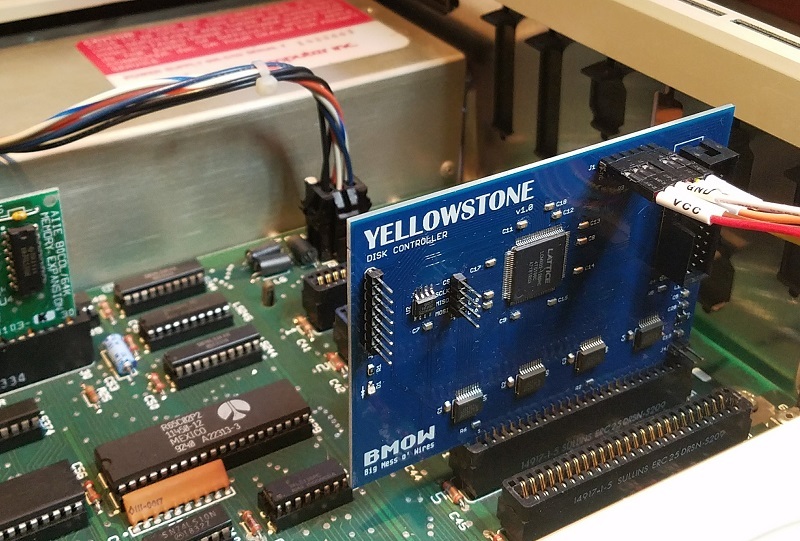 For anyone who wants to use a Yellowstone card *only* with a Floppy Emu, and doesn’t care about real disk drives, I could offer a version without the DB19-F cable. 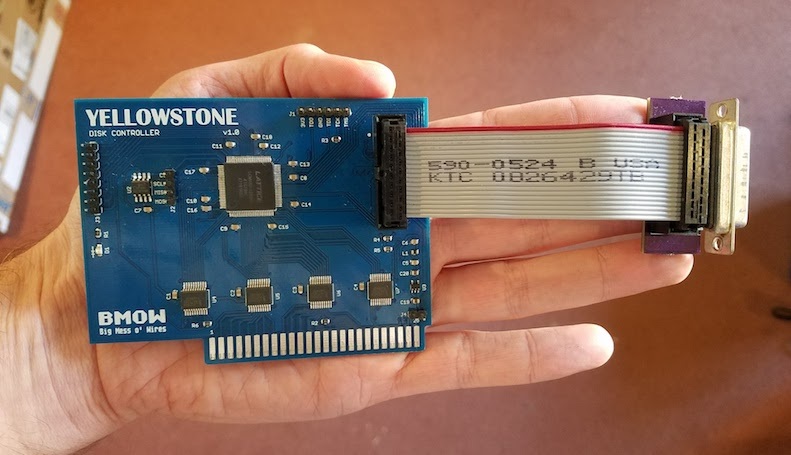 The Floppy Emu flat ribbon cable could be connected directly to the Yellowstone card without any DB19. I’d like to see LIRON and VTech/Laser/CPS Universal Disk Controller modes… a card that was switchable between that would control about any commonly available Apple II drive. The Superdrive is just not common for Apple IIs, very few made. As I suggested over on FB, if you were to do a UDC (or Disk ][ controller as opposed to Apple 5.25″ controller) a second IDC20 connector would be cool so it could control two drives or a FloppyEmu and a drive or even two FloppyEmus. Oh… I should have mentioned this before, but I don’t know if you’ve seen this before: http://iec.net/product/apple-disk-ii-controller-to-unidisk-drive-cable/ IEC still makes and sells a bunch of Apple disk cables (they also have serial, parallel and game port cables for the Apple II). Not terribly expensive either. I hadn’t even considered trying to clone any non-Apple hardware, so that’s probably not going to happen, sorry. What exactly interests you about the UDC card? You said earlier you didn’t really care about Superdrive. Maybe there’s some terminology confusion about “Superdrive” here. Apple only made three different 3.5 inch disk drives for the Apple II series that I know of: Unidisk 3.5 (A2M2053), Apple 3.5″ 800K (A9M0106), and Apple FDHD 1.44MB (G7287). Which of these drives is the one you’d hope to use with Yellowstone, that wouldn’t already be supported with the proposed design? A2M2053 is already covered by Liron mode, and nobody seems to care much about high-density disks and the G7287. 800K disks with an A9M0106 on the Apple II would require the Apple II 3.5 Disk Controller (aka the ‘SuperDrive’ Card), which is the thing I was saying would be difficult to clone and I’m not certain I could do it. I’d need to get my hands on one first to even begin to attempt it. The FDHD is the one normally referred to as the “Superdrive”. The UDC controls just about every Apple II floppy drive except the UniDisk 3.5 and the FDHD. It will control the Apple 3.5″ drive and Mac 400k and 800k floppy drives plus compatibles like the Chinon drives that VTech/Laser/CPS sold. The Mac floppy drives are often very cheap as are the Apple 3.5 Drives. FWIW, I don’t think the UDC is really that different than what is on the IWM. Most of the difference may just be firmware. You may already be closer than you think. I’m curious about what is in the GS and IIc that can control the simple and cheap Apple 3.5 drives that the Liron implementation lacks. For many of us, the Liron card isn’t particularly useful if the only hardware you can connect to it is the Unidisk 3.5. Granted, I do suppose that smart port devices also qualify, your Floppy Emu being one of them, as well as other Smartport flash based storage systems like the UnisDisk Air from Nishida Radio (another hard to find item, sadly). The biggest unicorn for me is the Vtech Universal Drive Controller that can control a range of drives, and was a fairly simple piece of hardware. 3.5 inch disks all use double the data rate of 5.25 inch (1 bit every 2 microseconds instead of every 4 microseconds). That’s near-impossible for the Apple IIe’s 1 MHz 6502 to process in real-time, which is why the Apple II 3.5 Disk Controller (aka the ‘SuperDrive’ Card) has its own on-board 6502 and 32 KB of static RAM for buffering. https://downloads.reactivemicro.com/Apple%20II%20Items/Hardware/Universal_Drive_Controller-VTECH-Central_Point/UDC-Short/Pics/P9230004.JPG The UDC also doesn’t have an IWM or SWIM, so whatever they’re doing is totally custom. I don’t own either of those cards, and they’re fairly rare and expensive. But even if I had them, cloning either/both of those cards would be very difficult, as they’re much more complex than the Liron, and also contain custom ICs. The Liron card can be comparatively simple, because all of the hardware required for the fast data rate of the 3.5 inch disk resides in the drive, not on the card. The feedback from Facebook and here has mostly been that people aren’t really interested in a Liron card, unfortunately. So I probably won’t go forward trying to make this a product – too much effort for what would be a very niche product. It was fun to build, though! That is the later version UDC with the ASIC. The early ones like I have were built with 74LSxxx and a few PALs. 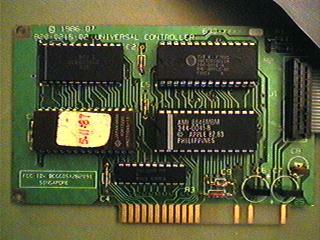 The card is much longer with quite a few more ICs and the IDC20 connectors on the end were along the top instead of the back edge. The early card is compatible enough with the ASIC version that the firmware is interchangeable. Reverse engineering the PALs could still be an issue because I’m sure the security fuses are blown. I don’t remember if those chips are socketed or not, I’d have to look at my card when I get home. I’m pretty disappointed that may not happen, I think that’s unfortunate. Especially since it is so close to being done. However, I completely understand where you are coming from. I’ve gotten overwhelmingly negative responses on every hardware project I’ve proposed on the Facebook group. It is to the point where I’m pretty close to ready to give up on any idea of building anything as a product. There are a lot of people who seem to nay-say everything, sometimes even things that actually already exist. I’ve heard some even complain that the currently available products are overpriced (accusing some of “gouging”) or deficient in some way or things like that, which I think is awful. I don’t think most of these people understand the economics of all this. And despite the nay-sayers there are some Apple II products that actually seem to sell out pretty quickly when they are in stock, even ones like the A2Pi card and Uthernet II which many criticize as being bad products (which I think is unfair). The current ridiculous asking prices for LIRON cards I personally think that despite what the malcontents say that there would be a demand for a clone. I’d think that if you could sell this for under $100 you’d sell quite a few and it may even sell a few more FloppyEmus if you can bundle it as a HD replacement too. People are lining up to order CFFA3000s, and the Yellowstone+FloppyEmu combination is a much closer competitor to that than the FloppyEmu is by itself. I’d guess the CFFA3000 will sell out quickly and this is likely to be the last run for 2+ years if ever due to Rich’s issue with obsolete parts forcing a complete redesign. That would put Yellowstone+FloppyEmu back to being one of the only consistently shipping flash storage options for the Apple II. Sorry I had to split this due to being long winded as usual. I have a UniDisk and I *am* interested in a Liron clone for it! Also if you could make the card compatible with Apple 3.5″ drive that would be good too. Forget that feedback on Facebook. There are over 1,000 people in the world who still care about and use Apple II, so go ahead and make the product. You are guaranteed to make sales. Especially if it is Apple 3.5″ drive compatible. Nice project! I’m going to check my Apple ][ collection to see what controller cards are in my IIes. I have experimented with the MachXO2. I know it says in the manual that the MachXO2 I/O can be set up to be 5V tolerant (internal diode, external resistor). That got meinterested in using it in a vintage computer add-on. I would be glad to hear if you investigated using the IO directly but found the LVC245 to be necessary. I am ultimately using ICE40 which is not 5V tolerant, so definitely using LVC245 for 5V bus tolerance. I don’t have a UniDisk 3.5, I do have a couple Apple 3.5 drives and a couple of VTech/Laser/CPS Chinon based Mac compatible drives. I also have a UDC and a LIRON… but I still want a Yellowstone. If it would do Apple 3.5 drives, I’d probably want two or three… But I would like one for sure. If you don’t make it as a project I hope you’d at least consider releasing the Gerber files and the FPGA code so DIYers could build one themselves. Or even better the CAD files and the Verilog or VHDL source. I don’t know which CAD you use, Eagle, KiCAD or one of the others… or which language you use for developing FPGA code. You spend too much time on Facebook. People snap up hardware for Apple IIs. If you build it, they will come. I want two. Aren’t Unidisk 3.5 drives extremely rare? That might explain the lukewarm level of interest. I suspect most A2 enthusiasts would want compatibility with the 800k Apple 3.5 drives, which I believe you said is not supported by this board. I have a couple of Central Point UDC boards (old w/ high parts count and newer with ASIC) and both work fine with Apple 3.5. > Sorry I had to split this due to being long winded as usual. > I know it says in the manual that the MachXO2 I/O can be set up to be 5V tolerant (internal diode, external resistor). That method can work, but it relies on the internal ESD protection diode which isn’t really designed for the purpose. I didn’t see resistor+ESD diode suggested anywhere in the MachXO2 datasheet, though I have seen it for other chips. For a one-off project, it’s a quick and easy solution, but I’m more comfortable using a real level shifter to get a robust interface. The 74LVC245 chips aren’t much more expensive than the resistor packs I would have needed anyway, so there’s not much penalty. I would be interested in a card for 3.5″ Apple Drives, but I don’t have any Unidisk Models,just the Apple3.5″ Drives..
Apple did make a card based equivalent of the IIgs and IIc+ disk port (card supports 5.25″, 3.5″, and Smartport all on the same port), they called it the “Apple II Universal Controller Card”. Problem is that its WAY rarer than even the Liron card. Instead of a 6502, it likely uses the “Magic Glue Interface” chip out of the IIc+ to be able to read 3.5″ disks on a stock 1Mhz Apple II. Problem with that is there are likely zero docs out there to clone that chip in a FPGA. I would buy one of these as well – I’d love to be able to run 3.5″ disk images on my Platinum IIe! > You are guaranteed to make sales. Especially if it is Apple 3.5″ drive compatible. I definitely agree a 3.5 inch controller clone would be a great thing. But I don’t have one to offer, and I’m not even sure how I would make one, due to the complexities I mentioned above. To even attempt it would almost surely push out the project’s finish line into the far future. It could be a “maybe somebody” feature, hardware permitting, but it’s just not something I can pursue right now. Can the Floppy Emu in Smartport mode make 800 KB disk images look like a Unidisk drive? If so then Yellowstone would serve the needs of those looking to use 3.5″ disk images on a II/II+/IIe, even if it can’t work with physical drives other than the Unidisk. I have several Liron Controllers but I think the Yellowstone card will be very cool! A nice generic FPGA card is cool in itself especially if you can offer it at lower than $100. The possibility to add generic SPI Hardware to the mix could allow for more flexibility in the future. I just wanted to add that I can offer to give you 2 UDC (older and newer version) as well as the BlueDisk (1.44mb MFM Controller) and the ERPHI controller (another MFM controller). I would offer these cards as either unlimited free lease if you are interested or they can be gifted. I’d buy one. I hope you make a run of them! I’d also buy one when they are ready. Nice work! I second the idea that it would be useful paired with a Floppy Emu more than anything else, though I have a few UniDisk 3.5s and actual Liron cards. I’d most likely install these in Apple ///s, I’d certainly buy at least one myself. OK, maybe there’s more interest in the Liron / 5.25 functionality than I thought. I’ll keep playing with it regardless, and see how close I can get to “product ready”. Jonas, thanks very much for your UDC offer and I’ll probably take you up on it, once I’m ready to look more at other disk controller types. A few people asked about price and timing. Both are hard to estimate when I’m not quite sure what hardware or features would be on the finished card, but I would guess under $100 and maybe 2-6 months depending on features and my productivity. I normally use only the CFFA 3000 in my main A2s but I do this only because I cannot use up too much slots. I would like to be able to connect a 3,5″ and a 5,25″ Floppy without taking my systems apart and removing cards to do so. If you were able to add a basic hard disk feature from SD card, I would most likely replace the CFFA in my A2e. If you were able to integrate basic FloppyEmu functionality into the Yellowstone as well, I would pay much more than $100 for sure! Contact me for the shipping of the cards as soon as you need them. I have a 2e and a 2c+ and I want to be able to move data & programs between the two. I need either a 3.5″ drive on the 2e or a Smartport on the 2e & a Floppy Emu. If you ship the Yellowstone, then I’m all in for one and a FloppyEmu ! I would be interested in a Liron card. Would the code and designed be released? I hope the card comes out, it is really needed one. The Apple 3.5 Controller (aka SuperDrive Controller) does have a 6502, but the only thing particularly complex on the card is the SWIM (as compared to the IWM). I spent some time reverse-engineering most of the 3.5 Controller firmware a few years ago. If I were implementing this in an FGPA myself, I might not try to reproduce the SWIM, but just use the IWM implementation you’ve already developed, and add an implementation of the 1793 to support MFM. I’ve got a partial 1793 implementation in VHDL but have more work to do on it. Of course, the 6502 code in the firmware to support MFM would then have to change. Good to see someone is working the FPGA project like this. I would like to get one if the card is ready for production. Just for LIRON clone, i’ll personally buy at least one. Smartport hard drives with Floppy Emu’s is what i need. And i want to add my personal point of view on the development of the project. I bought Floppy emu and I will buy, I hope, Yellowstone, and we would wonder, as our wives and friends probably do: why? The answer for most of us I think would be to relive those moments, breathe a piece of history, appreciate the jewels that few now know how to recognize. A card that adds 4k high resolution or can read ntfs files with Apple IIe? Everything could be done, but who would want it? Those who want a powerful and versatile computer can buy a MacBook I7 or a Windows 10 system! Just an FYI, but it looks like ReactiveMicro is preparing another run of their Superdisk 3.5 controller clone. Don’t know where they are sourcing ICs like the SWIM chip, but the price shows that cloning that card is not a cheap endeavor. The price of their TranswarpGS clone is even more eye-watering. If there was a card ripe for FPGA cloning, its that one. I think it’s great they’re making a Superdisk 3.5 clone again, although I’m a little confused by the approach. From the photos it looks more like an exact replica of the original card using vintage 80s components, rather than a functional clone. I asked Ultimate Micro about this a year or so ago but didn’t get an answer. My guess is the SWIM chips are coming from salvaged IIgs and Macintosh motherboards. The photo of the card shows lots of socketed PLCC chips, and even a socketed DIP EPROM, which maybe could be replaced with newer and cheaper 2018-era parts. Personally, I would like to see a clone of the SWIM. Mainly for repairs and modding in the Mac world. I am quickly running out of replacement SWIMs for repairing fried ones on the mac portable, so an FPGA programmed as a SWIM and making an adapter board to PLCC would solve that problem. And then of course I would like to add SWIM/HD support to the Mac Plus because why not? I second the endorsement for continuation on working on this project. I have a Unidisk 3.5 and would love to use it on my IIe which is my primary computer. One other thing to mention…. You’re asking for recommendations for other disk controller projects. My all-time favorite disk controller happens to be what is called the Prometheus “Applesurance” which is a disk controller that not only boots 16-sector disks, but it also does a full diagnostics of your Apple II, by checking RAM and ROM, among other things. Since your card is booting the computer, might as well have it do other tasks in the process. The user can disable diagnostics and boot only by holding down the space bar during booting. My Applesurance card also supports only the II/II Plus, since it was made before the IIe ever existed. Another disk controller to look at is the MicroSCI disk controller, also known as the Franklin Computer disk controller. The reason I like this card is that you can move a jumper between 16-sector and 13-sector boot support. I have one card that actually does this without jumpers, but it crashes when booting ProDOS. Personally, the Disk II controller is not worth cloning. There’s way more than enough of this card around on eBay, selling on average $15 each. I have about 20 of these myself. Same with the 5.25 disk controller – it is virtually the same as the Disk II controller but with a different disk drive connection. Making the EEPROM functional if its still there on the card should be to much additional work, says someone thats a complete weekend hacker at hardware, and would make it more useful for someone without other mass storage devices. Just throwing another vote behind this project. I already own a Floppy Emu and I have an odd use case: I accidentally blow up my IWM on one IIgs, which otherwise works perfectly. So….I have a rather limited 5.25″ controller card in there right now and can no longer use the Floppy Emu or 3.5″ drives. Basically it’s relegated to a high-speed IIe. 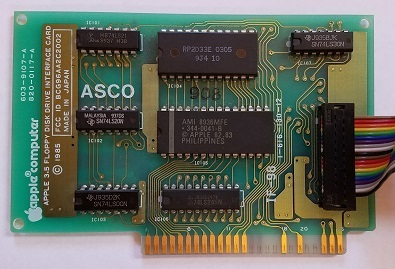 Definitely like the idea of this card as a swiss army knife: (1) Make the IIgs workable or (2) add functionality to my actual IIe or (3) act as a fancy bridge card for my Floppy Emu. I was wondering if you are still considering to produce this card. 1. Add a port that can accept a cheap RTC card such as the KEYES DS3234 ($5 or less on eBay)) to have a Real Time clock card (these are rare these days). 2. A combo serial and full parallel port (so the parallel port can be used as IOs). 3. A GPIO port, I think it will be cool to be able to write basic/assembly programs on the A2 to control/monitor stuff instead of using an Arduino.